Almost entirely surrounded by land, the Mediterranean comprises not only the familiar Adriatic, Aegean, Balearic, Ionian, Ligurian and Tyrrhenian seas but also the lesser known Alboran and Levantine Seas, the Seas of Crete and Sardinia, and even a Sahara Sea. It makes sense then to explore seas and surrounding lands with a local, familiar with the very best bays, beaches and historic ports, many inaccessible to large ships. Marseille-based PONANT luxury expedition cruises has been sailing these waters for almost thirty years. This is their backyard and your cruise introduction to the Mediterranean and all her beauty, whether by small expedition ship or classic three masted yacht. 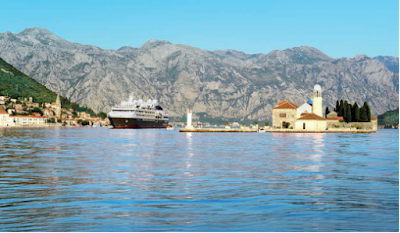 PONANT offers an extensive range of Mediterranean cruises - 31 departures between April and November 2018, with a range of 7 to 9 night itineraries visiting 8 countries that include many important UNESCO World Heritage sites. Itineraries showcase a diversity of destinations endowed with layers of civilisation reflected through history, art, music, architecture, language and boundless culinary temptations. Monique Ponfoort, Vice President PONANT Australasia, expands on the options: “From Gibraltar to Athens, Venice to Corsica, enjoy the many facets of the Mediterranean including Zodiac landings on secluded beaches or in the heart of small ports. Pass through the narrows of the Corinth canal connecting the Adriatic and Aegean Seas. At just over 21 metres wide it is hard to conceive of a larger vessel than one of PONANT’s sister ships managing to squeeze its way through this historic waterway. Or visit the diminutive mythological Greek island of Delos in the Cyclades archipelago, sanctuary to the god Apollo and birthplace of Artemis. Whether it be observing active volcanoes or sipping Sicilian wine, marvelling at the extraordinary mosaics of Monreale or photographing the bronze horses in Piazza San Marco, select from PONANT’s Mediterranean collection of voyages confident that you will enjoy life onboard and ashore discovering the multiple charms of the Mediterranean with a local. Some voyages are specially themed to appeal to those who have specific interests, for example gastronomy, music (jazz, classics and opera) or playing a round of golf on some of the Mediterranean’s stunning courses, while other guests may enjoy discovering the underwater world of the Mediterranean, Scuba diving while on Le Ponant. PONANT Bonus advance purchase savings off the published fare currently apply to voyages but savings will reduce as space is sold. Book now while some voyages are available at up to 30% savings. Discuss your preferences with PONANT’s reservation specialists or your travel agent in order to secure not just the best price but the largest range of accommodation options available. WHY CRUISE THE MEDITERRANEAN WITH PONANT? PONANT represents France’s proud maritime tradition, with the youngest fleet of luxury and expedition ships in the world. Based in Marseille, Europe remains the heart of the company, with this selection of cruises representing the very best of PONANT’s almost 30 years of cruise experience. Choice is important and PONANT offers four sister-ships and a classic yacht, with a range of interesting itineraries designed to reveal highlights and hidden treasures of the Mediterranean and Baltic seas. 2018 will be the inaugural season for two of PONANT’s new Explorer class small ships - Le Laperouse and Le Champlain. Because cruising does not mean just seeing the coastline and brushing the shores, PONANT offers another perspective, with a comprehensive programme of shore excursions to enhance the voyage experience. The PONANT hallmark - French ambiance, fine food and wines (open bar included, of course), intuitive service, indulgent pampering options and renowned design touches, all the while travelling in understated luxury - is epitomised in this collection of Mediterranean itineraries.